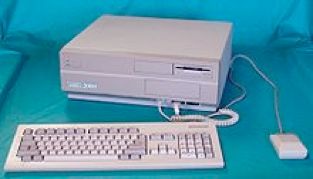 After Commodore bought the Amiga company they developed the A500 for the home market and the ”expandable” A2000 for, well, maybe the business market. Hard drives where too expensive to most friends of my age at that time. Anyway, that didn’t stop me from buying an A2000 during a trip to Germany. This is the one I still own. The clock battery was placed close to the processor which was really smart (?) since it started to leak acid after 10 years in the attic (luckily the A1000 doesn’t have those batteries!) and probably has destroyed a large number of A2000 (and A3000 as well). Mine had leaked a little as well, but I managed to restore it anyway (but not thanks to Commodore!). The A2000 isn’t very beautiful and not more powerful than the A500 or A1000 (though has 1MB RAM as default) but it IS expandable. Today I have a SCSI card and SCSI hard drive for it, but can’t use it until I got the original Kickstart v1.3 ROMs switched to the needed v2.04.